Om. May That guard us two—teacher and pupil; may That save us two; may we two do the work with valor; may we be full of radiance; may the lesson be well learned; may no discord arise to separate us. Om. Peace; Peace; Peace. Bhrgu was Varuna’s son; he came up to his father Varuna: Master, teach me the Eternal, said he. The world-food, the breath, the seeing, the hearing, mind, the voice,—he answered him,—That from which these beings are born, That by which when born they live, That to which they go forward and enter it completely, try to find out That for yourself,—That is the Eternal. He brooded fervently; and, brooding fervently, he thought: the world-food is the Eternal; for it is exactly from the world- food that these beings are born; by the world-food, when born, they live; the world-food they go forward to and enter it completely. And, thinking thus, he again came up to his father Varuna: Master, teach me the Eternal, said he. The Master answered him: try to find out the Eternal for yourself by brooding fervently, for the Eternal is fervent brooding. He brooded fervently; and, brooding fervently, he thought: the breath is the Eternal; for it is exactly from the breath that these beings are born; by breath, when born, they live; breath they go forward to, and enter into it completely. And, thinking thus, he again came up to his father Varuna: Master, teach me the Eternal, said he. The Master answered him: try to find out the Eternal for yourself by brooding fervently, for the Eternal is fervent brooding. He brooded fervently, and, brooding fervently, he thought: mind is the Eternal; for it is exactly from mind that these beings are born; by mind, when born, they live; mind they go forward to, and enter it completely. And, thinking thus, he again came up to his father Varuna: Master, teach me the Eternal, said he. The Master answered him: Try to find out the Eternal for yourself by brooding fervently, for the Eternal is fervent brooding. He brooded fervently, and, brooding fervently, he thought: the soul that knows is the Eternal; for it is exactly from the soul that knows that these beings are born; by the soul that knows, when born, they live; the soul that knows, they go forward to, and enter it completely. And, thinking thus, he again came up to his father Varuna: Master, teach me the Eternal, said he. The Master answered him: Try to find out the Eternal for yourself by brooding fervently, for the Eternal is fervent brooding. He brooded fervently; and, brooding fervently, he thought; Bliss is the Eternal; for it is exactly from bliss that these beings are born; by bliss, when born, they live; bliss they go forward to, and enter it completely. This is that teaching of the sage Bhrgu the son of Varuna; this stands firm in the supreme holy ether. He who knows thus, stands firm. Possessing the world-food, he becomes a consumer of the world-food. He becomes mighty through offspring, flocks, radiance of the Eternal, mighty in renown. Let him not reproach the world-food; this is the sacred vow. For the breath is verily the world-food; the body is a consumer of the world-food; in the breath the body rest firmly; in the body the breath rests firmly. Thus the world-food rests firmly in the world-food. He who knows the world-food thus resting firmly in the world-food, himself stands firm. Possessing the world-food, he becomes an eater of the world-food; he becomes mighty through offspring, flocks, radiance of the Eternal, mighty in renown. Let him not overlook the world-food; this is the sacred vow. For the waters verily are the world-food; the fire is a consumer of the world-food; in the waters the fire rests secure; in the fire the waters rest secure; thus the world-food rests secure in the world-food. He who thus knows the world-food resting secure in the world-food, he himself rests secure. Possessing the world-food, he becomes an eater of the world-food; he becomes mighty through offspring, flocks, radiance of the Eternal, mighty in renown. Let him magnify the world-food; this is the sacred vow. For the earth is the world-food; the shining ether is a consumer of the world-food; in the earth the shining ether rests secure. In the shining ether the earth rests secure; thus the world-food rests securely in the world-food. He who thus knows the world-food resting secure in the world-food, he becomes an eater of the world-food; he becomes mighty through offspring, flocks, radiance of the Eternal, mighty in renown. Let him not refuse to any a part in the habitation; this is the sacred vow. Therefore, by whatever practice, let a man gain the world-food abundantly. The world-food has been made ready for him,—thus they say. This world-food has, verily, been made ready from the head; from the head for him it is made ready. This world-food has, verily, been made ready from the middle; from the middle for him it is made ready. This world food has, verily, been made ready from the end, from the end, verily, for him it is made ready. He who knows thus: as power, this is in the voice; as possessions, in the forward breath and downward breath; as work, in the hands; as going, in the two feet; as putting forth in the power that puts forth; these are the human names of That. Then as to the names of the shining powers: as fulness, this is in the rain; as force, in the lightning; as well-being, in the flocks; as light, in the houses of the stars; as lord of being, immortality and bliss, in the power that generates; as the all in the shining ether. Let him draw near, saying: this is the secure resting place. He gains a secure resting place. Let him draw near, saying: this is the mighty. He becomes mighty. Let him draw near, saying: this is mind. He becomes possessed of mind. Let him draw near, saying: this is the power that bends. His desires are bent before him. Let him draw near, saying: this is the Eternal. He becomes full of the Eternal. Let him draw near, saying: this is the Eternals destroying power. His enemies who dwell within his house are destroyed, and the Sons of his brothers who are not dear to him. The power that is here in the spirit, and the power that is there in the sun—that power is one. He departs toward, and reaches, the self formed of bliss. Passing through these worlds, possessing the world-food according to his desire, taking forms according to his desire, he dwells there, singing this song of oneness. I am the eater of the world-food, I am the eater of the world-food, I am the eater of the world-food. I am the maker of the song, I am the maker of the song, I am the maker of the song. Before the shining powers, in the heart of the immortal. Thus the teaching of hidden wisdom. May That guard us two; may That save us two; may we two do the work with valor; may we be full of radiance; may the lesson be well learned; may no discord arise to separate us. Bless us Mitra; bless us Varuna; bless us Aryaman; bless us Indra, Vrhaspati; bless us wide-stepping Vishnu. Obeisance to the Eternal; obeisance to thee, Breath; Thou art verily the manifested Eternal. I will declare thee, the manifested Eternal. will declare the true. I will declare the real. May that guard me. May that guard the speaker. May it guard me. May it guard the speaker. For there can be no teaching until the pupil has thought and lived himself into the spirit of the master; no beginning of the teaching until the pupil finds himself already doing, though with imperfect light, the same great work that the master has already long been doing with valor and perfect wisdom. 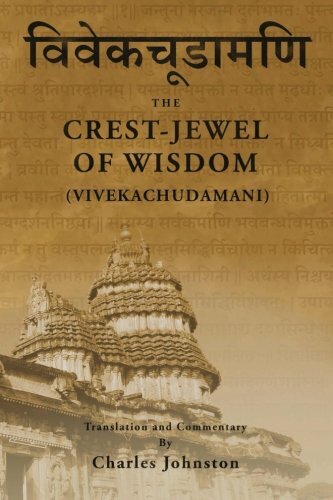 The lesson here is the parable of an ideal teacher and his pupil; a form of teaching used everywhere through these books, as where Death teaches Nachiketas; where the kingly sage teaches Uddalaka; where Uddalaka teaches his son; where Pippalada teaches his six pupils. The teacher, the higher Self, or one in whom the higher Self is absorbed, and brightly shining; the pupil, the habitual self, reaching up toward the higher Self, and striving, above all things, to let no discord keep him apart from the higher Self. The pupil, following this excellent counsel, set himself to find out the Eternal for himself; he made his thought flow outwards to the world without him, then return within him, to become conscious of its own being; he let the Self which is wisdom do its own work in the secret place of the heart; or, to use the quaint phrase of the old book, he brooded fervently. The world-food, he thought, must be the Eternal; the wonder-full stuff, whatever it be, that pictorial outer things are built up of; the substance of the sun and stars, the mountains and rivers, the sky and sea. But the master sent him back again to learn the lesson, neither saying that this world-food, the strange substance of outward things, is the Eternal, nor that it is not the Eternal. His answer drove the pupil again within himself, and withdrawing again to the secret place of the heart, he grew to feel that that strange substance of outward things and appearances is not the all in all; that there are other powers moving this and breathing through it; or, in the words we are used to, that matter is not a reality, a thing in itself, but only the hiding place of force; that the atoms of matter are not absolute, but only centres of force. But we will keep to the old picturesque speech of Bhrigu; the world-food is not all; there is the breath that lives and breathes through the world-food; the breath must be the Eternal. Again the Master, neither denying nor affirming, sent the pupil back to brood once more within himself. Growing more vividly conscious within, he saw that this vivid emotion and feeling of his were a greater reality even than the breath; that they were nearer to him, known at first hand, while the world-food and the breath were known only outwardly, at second hand, known only through his own vivid emotion and feeling. This vivid feeling, mind, he thought, must be the Eternal. Again sent back by the Master, he saw that even feeling and mind are more outward than the soul within him that perceives them, and this soul that perceives, he thought, must be the Eternal. At last, by a happy inspiration, he discovered the teaching to which the master had been leading him: Bliss is the Eternal; the Eternal is Bliss. The one reality is the Self that is Bliss, self-being, self-subsisting, self-satisfying, the fulness of all things forever. The one pain is deprivation, separation, antagonism: but in the one Self that is the All, there can be no deprivation, no separation, no antagonism, no pain; only perfect Bliss for ever. Thus the teaching of Bhrigu; and one can hardly imagine a better and happier way of picturing the onward path of life, where each advance is marked by the appearance of a new self and a new world; not confounding and destroying the old, but transforming them, illumining them, penetrating them with a life that makes all things new. Then follow a series of admonitions, to establish the learning soul in the right way. Let him not reproach the world-food; let him not turn back in bitter asceticism from the great outward pictorial world; for it is the garment of the Self, woven by the breath for the purposes of the Self. Let him not reject and spurn life, but rather gladly accept and learn its admirable wealth. For the divine world-food,—the Self,—rests firmly in the outer world-food,—the pictorial universe,—and the whole of the universe is to be made radiant and breathing by the Self, till it becomes one with the Self, till nothing is but the Self. Let him not refuse to any a part in the habitation; for all selves are his other selves; rays from the one Self that is his own truest Self. The powers of the Self lie hid in all things, in voice, breath, hands; in cloud, lightning, fire. Let him draw near and become possessed of them. And there is the destroying power of the Self that is to destroy the enemies of the Self, deprivation and separation and antagonism; these are the enemies who dwell within his house; they are the sons of his false brothers,—the children of the lower selves of passion and hate that usurp the place of the one true Self. When all the children of separation are destroyed, he becomes one with the Self, the Self that is the world, and dwells there, singing the song of oneness, knowing himself to be the breath within the world-food, the inventor of the game of life, the maker of the song: I am the first born of the true; born in the heart of the immortal, before the shining powers; I have perfectly become all that is; I am full of golden light.